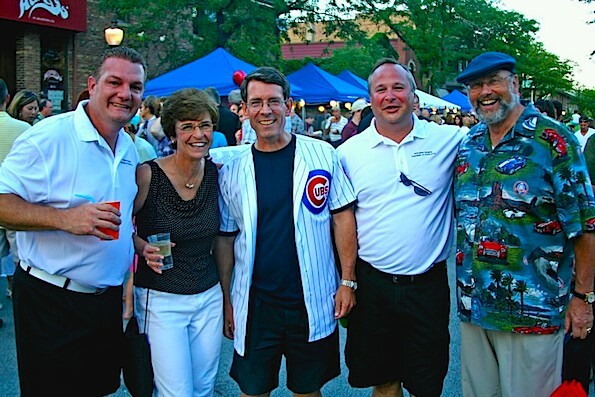 Thomas Hayes (third from left), with Mayor Arlene Mulder () and her husband Al (far right). Arlington Heights Trustee Thomas Hayes announced Monday that he will run for village president in the April, 2013 election for mayor. Village Trustee Thomas Hayes served his first term when he was elected to the village board in 1991 — the same year that Arlene Mulder came on board as a village trustee. Arlene Mulder, who was elected mayor in 1993, announced September 18, 2012 that she will not run for re-election. Hayes also has experience as president pro tempore during his service as a village trustee — stepping in when Mayor Arlene was unavailable. Village Trustee Thomas Hayes has lived in Arlington Heights for almost 30 years and is a lawyer based in Chicago. He has worked as a lawyer since 1986, when he received his J.D. from DePaul University., much of the time also serving in active duty and reserve duty in the U.S. Army. He graduated the U.S. Military Academy at West Point in 1978, and retired from the Army as a lieutenant colonel in 2001. after more than two decades of service on active and reserve duty. According to the law firm of McKenna Storer, where he is an associate, Hayes was admitted to the Bar of Illinois and the United States District Court for the Northern District of Illinois, 1986, and the United States Court of Appeals, 7th Circuit, 1999. Hayes was also admitted to the Bar of the State of Missouri in 2008, and is a member of the Illinois Association of Defense Trial Counsel and the Defense Research Institute. His area of focus is toxic torts, including asbestos, mold and chemical exposure. Thomas Hayes is also a long distance runner, and has participated in several marathons and half-marathons. He recently finished the Boston Marathon in April 2012 with a time of 4:27:10. In 2008 he returned to Arlington Heights by Monday night to attend Monday’s village board meeting after running the 2008 Boston Marathon the same morning.